The Sad State of Leadership Development - and a Solution | MC Associates Inc.
It’s estimated that U.S. companies spend over $14 billion annually on leadership development. Match that number to the abundant and growing research that finds most leadership development to be ineffective and the conclusion is a phenomenal amount of waste. A 2015 study by the Brandon Hall Group found that 81% of organizations reported that they were not very effective at developing their leaders, . Only 18% reported that their leaders were very effective at meeting key business goals. In a survey conducted by the Ashridge Business School in the UK, only 7% of senior leaders said that their organizations effectively develop global leaders. A 2017 Corporate Leadership Council survey of 1500 managers in 53 organizations around the world found that 76% felt that their learning and development functions were ineffective in helping them achieve business targets. • A 2017 survey by McKinsey found that only 11 percent of 500 global executives felt that their leadership development efforts achieved desired results. In the 2017 CEO Challenge study conducted by the Conference Board, only 41 percent of global CEO’s felt that their leadership development efforts were of very high or high quality. As disheartening as these research finding are, experience and recent evidence-based practices convinces my colleague, Richard Citrin, and me that the situation does not need to be that dire. Properly designed and executed leadership development can make a difference. We’ve distilled the key design features into a model we call Strategy-Driven Leadership Development. Accelerating the development of mission-critical competencies through Intentional Leadership Development. Each component of the model has a set of evidence-based practices and tools to assure that leadership development will have a desired impact and a return on the time and money invested. 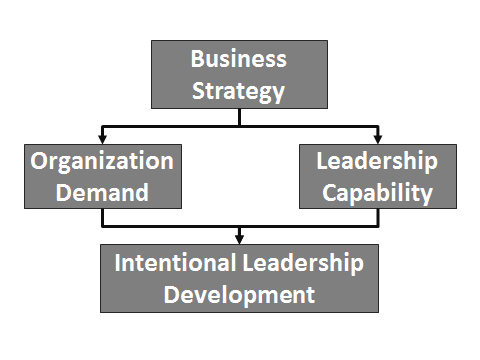 Watch this blog for more details about Strategy-Driven Leadership Development. We are also wrapping up our work on a soon to be published book, entitled Retooling Leadership Development: An Executive’s Guide to Driving Results through Strategy-Driven Leadership Development, that will review the evidence and model in detail. This entry was posted in Leadership and Executive Development, Strategic Talent Management, Strategy Development and Execution by Michael Couch. Bookmark the permalink.